Tor Ultra. Surprisingly light and very stable. I’m not sure how you feel about the adventure tab here at Shifter, but let me say I believe this tab is perhaps the most critical of all. And I have a LOT of tabs people. Too many, probably. Too many Flemming and Charlene said, and I trust these two when it comes to anything dealing with tech, computers, software, Singapore, Inca Kola, Star Wars, website tabs, fortune telling, Danish farm life or Fuji systems. Let’s talk about shoes. We all love gear right. Shoes are critical. Especially for anyone doing murderous things to their feet. Like me. I would rate my climbing shoes as the most horrible of footwear. Imagine trying on your eight-year-old sister’s slippers and you will begin to know what it feels like to wedge your foot into a climbing shoe. But man do they work, so we suffer for it. When it comes to hiking, running, trail running, scrambling or approach however we need to actually think about what remains between our soft flesh and the ragged edges of Mother Earth. I want to talk specifically about two brands and two models. Oh, I should mention I’m fully sponsored by both brands and am paid just about exactly the same amount as a top Formula One driver, astronaut or gastroenterologist. Hope you don’t mind. Promise it won’t influence my review. Hoka One One is a brand I’ve been in love with for a long while. Hoka has gone against the decade old trend of minimal shoes. 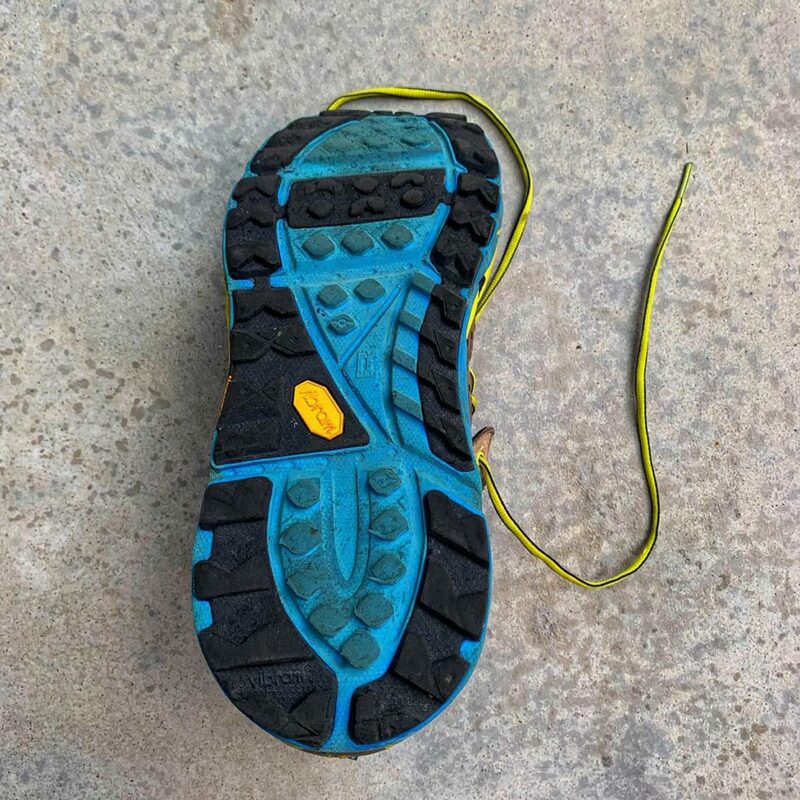 I’ve used Hoka running shoes, trail shoes and even their hiking boots which is what I want to discuss here. The Hoka Tor Ultra. Yes, they are expensive but remember that part about your soft flesh and the ragged Earth? This is where I can say “Money well spent.” I bought my pair several years ago and they are still going strong. 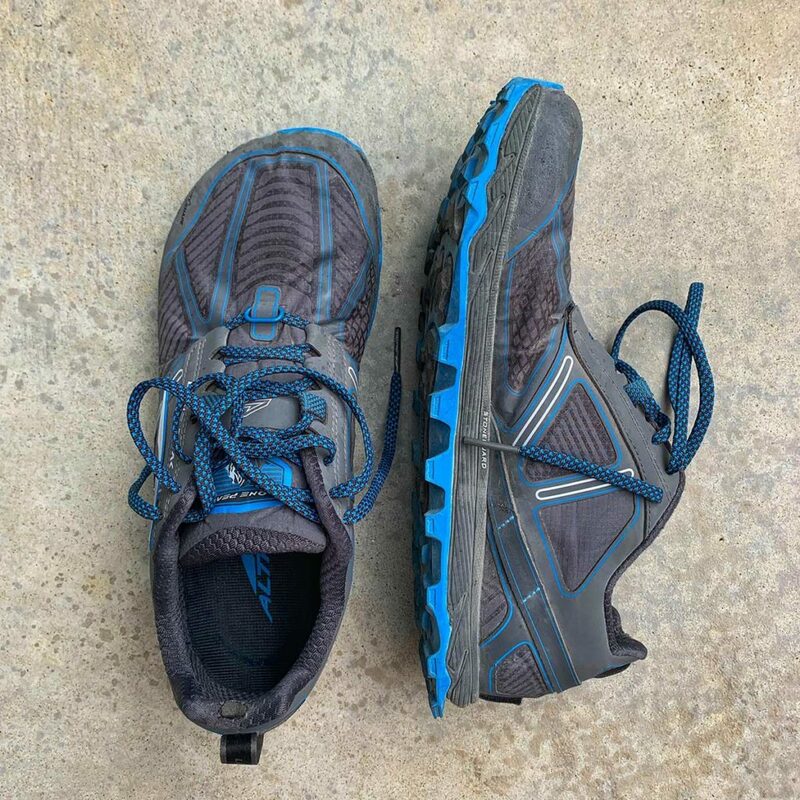 I’ve worn these babies on countless hikes, many day-long hikes and several summit climbs including Santa Fe Baldy more times than I can recount. 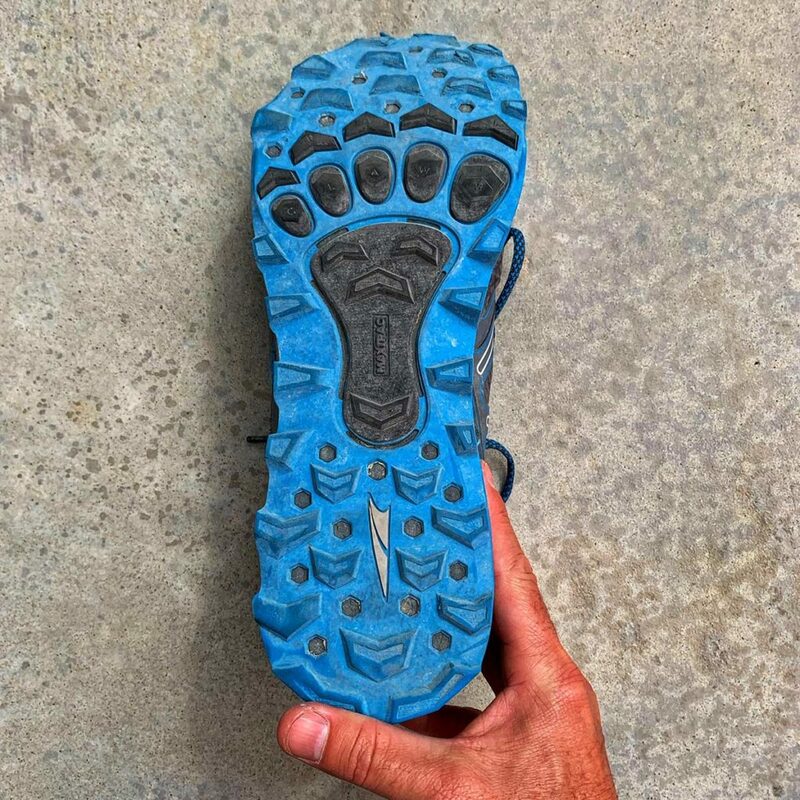 The Hoka’s are so solid, steady, supportive and massive at their base they handle even the most talus of fields. Whatever the Paleolithic Era threw at the planet can be trekked over without a thought. And they are waterproof. But like any good photographer I’m always looking for the gear I don’t have and always looking for reasons to distrust my current system. That’s just what we do. So let me introduce the Altra Lone Peak 4 Waterproof. These are great shoes. Super light, zero drop, wonderful protective base and a super wide toe box, which is one of the main reasons people flock to this brand. My brother is an Ironman, does all kinds of crazy trail runs and marathons and other hairbrained things and he runs in these babies as well. Lone Peak 4’s. Light, fast, great protection. But very wide. So I did what any good pseudo athlete does. I threw the Hoka’s in my truck and used them as a barrier between my bikes and the truck bed. Crushing them over and over again, watching as they got wet, baked in the sun, got wet, baked in the sun, etc. I tortured them. After all their time of being faithful to me. Shoe abuser. Two months ago, while wearing the Altras for the very first time, I ran a 30k trail run at the US/Mexico border. The shoes were great. But there are two issues I’m having, one is my fault and the other is..I dont know. 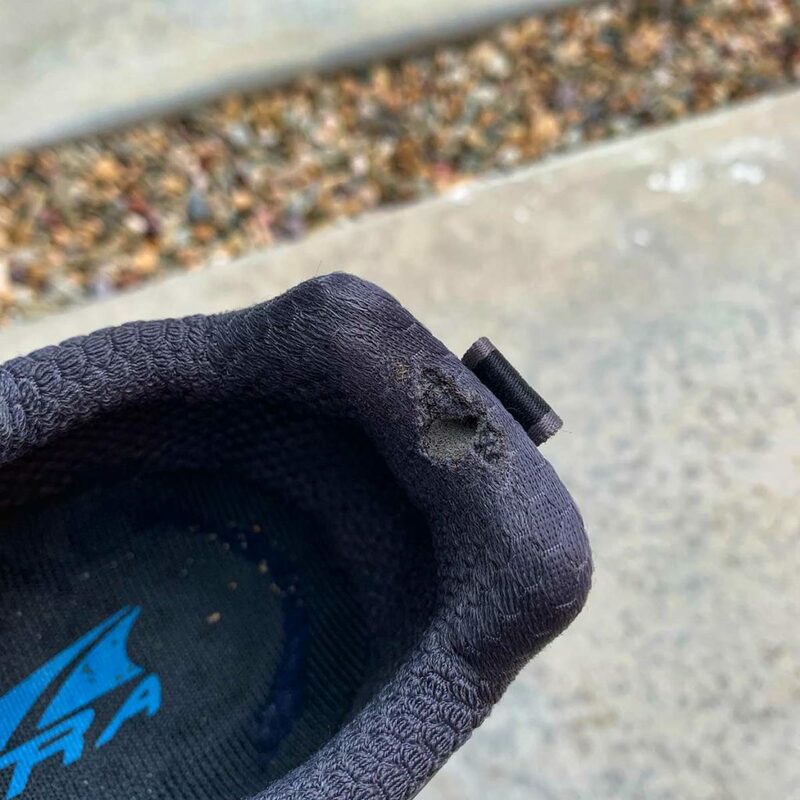 First, I have very narrow feet, so the wide toe box of the Altra, which I do love, allow my feet to move around quite a bit. This means I have to really lace them tight and even so I still get quite a bit of drift. I knew this going in, and this is entirely on me. I’m not sure I can deal with this in the long run. Again, not the fault of the brand. Off the charts grip and protection here with these angles. Think Dolph Lundgren of shoes. The second issue I’m having is in the photograph below. The shoes have already developed identical holes at the top of the heel support. Very odd. Almost perfect circles. Almost like there wasn’t any material in there to begin with. No idea if anyone else has had this issue. Not a deal breaker by any stretch. I don’t notice while I’m using the shoes, but it does make me wonder. Strange hole on both shoes in the exact same spot. No idea the cause. 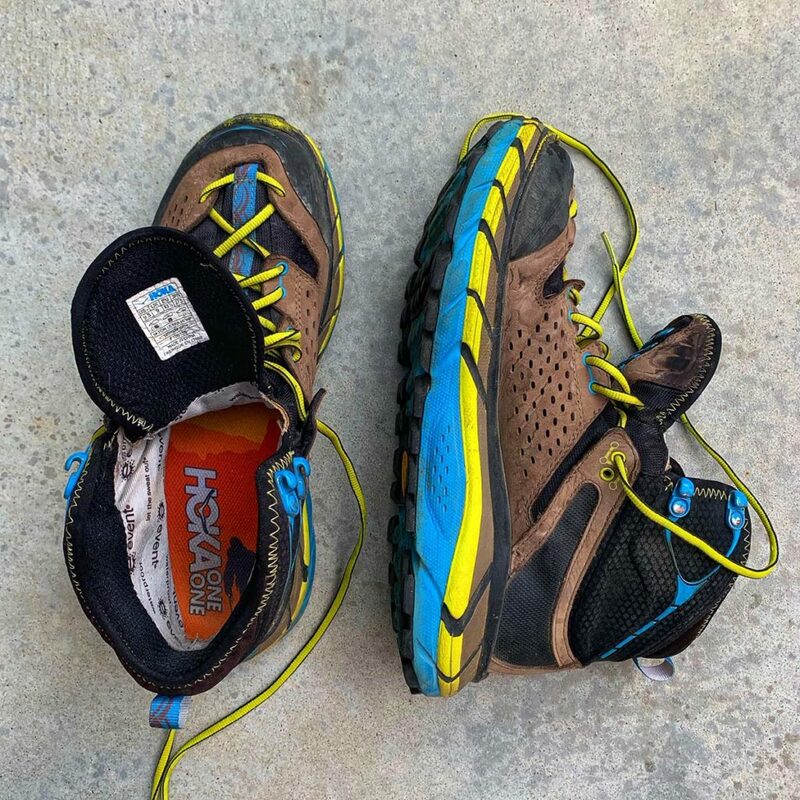 So last week I looked into the bed of my truck and noticed my abandoned Hoka boots. “Sorry friend,” I said I dug them out and put them on. “Hey, these feel pretty good,” I thought, so I went on a six-mile hike/run and when I was finished I realized I didn’t need new boots or shoes. I should have just kept to the ones I already had. Learn from me people! Now, ultimately I will wear both these shoes out. And I will get more. I do love how light and small the Altras are, and they are totally usable when I’m driving. The Hoka’s are so think it’s almost impossible to feel the accelerator when I’m driving so I take them off. They are, after all, hiking boots not trail runners. If you don’t know these brands make sure to check them out. I’m lacing up my boots now. I’m aiming at a place that lives up above me. You should go too. AMENDMENT: I wrote this post yesterday and this morning I did a seven-mile out-and-back. A steep, rock strewn fire road, and I have to say, the Lone Peak’s really were outstanding. The more I wear them the more I like them. I think I could get away with a half size smaller, but the traction, protection and weight are truly top notch. Not to mention, the wide toe box has really helped my bird like feet spread their wings. (I have less heel pain in these shoes.) Stay tuned for coming post in regard to another pair of shoes I’m wearing that I think you should know about. I have really fucked up feet and ankles and the Altra Instinct shoes have served me very very well indeed. There zero drop has changed my life, literally. Much less ankle/leg pain. Me too. That Zero drop thing doesn’t seem like it would be a big deal but it surely is. I’m going to post about another brand I found, of street shoes, that do the same.